This page has been prepared to provide some type of table of contents to the various items which ‘will be included in this chapter “The Thirteenth Satanic Bloodline”. In my writings this bloodline has been interwoven into the text of many articles, but It hasn’t been singled out very much. Although a great deal has been mitten by this author on this final family, to pull out articles which concentrate on it solely is difficult. After assembling some pages on it, a few words of explanation were still needed. This bloodline is harder to track because it weaves in and out of the other 12 bloodlines. There are many surnames which are part of this bloodline (Including the Smith family), however I can give one very prominent one, the Sinclair family. 2nd Feature Article – THE 13TH ILLUMINATI BLOODLINE. This bloodline is so extensive in its many branches that its membership takes in many of the Presidents of the United States, including George Hush and George Washington. The reason that I gave the genealogies of the some of the Mormon Presidents to people back in 1991 in my Be Wise As Serpents book is that all of the Mormon Presidents in history, whether RLDS or LDS, trace their blood back to this 13th bloodline. Within the Illuminati rituals, the emphasis of the 13th bloodline is that they are the seed of Satan. As their secret story goes, they are the direct descendents of Jesus’ spiritual brother Lucifer. Since the Freeman family and the Rothschild family have members who are also in the 13th bloodline, It is unclear to me how interwoven the “seed of Satan” is. “The Curse of Canaan” is an interesting book along with its mate World Order by Eustice Mullins. One of the books which I looked with difficulty for before finding it, was Gerald Massey’s A Book of the Beginning (Secaucus, NJ: University Books, Inc., 1974.) The book goes in and shows in detail how the inhabitants of the British Isles came originally from Egypt. This is Important because (as this newsletter has always contended) the Druidism of the British Isles was simply a derivative from the Egyptian Satanic witchcraft/magic of Ancient Egypt. The Egyptian word Makhaut (clan or family) became the the Irish Maccu and the Maccu of the Donalds (clan of Donalds) now reflected in the name MacDonald. The sacred keepers of the Clan-Stone in Arran, were also known by the family name of Clan-Chattons. Another word for clan is Mack and the Clan-Chattons were also known as Mack-Intosh. Ptah-rekh the name of the Egyptian god Ptah was passed down to us by the Druids adopting the name Patrick, which sounded similar. St. Patricks day then is a Christianized form of a druidic holiday which originally had its origins in Egypt. The All-Seeing Eye can be found on ancient buildings in ancient Chaldea, in ancient Greece, and in ancient Egypt. The MI-seeing eye represents Osiris. Osiris had debauched revelries (saturualias) celebrated in his honor. The temples in Arabia clear back in the time that Moses had his black father-in-law Jethro used the all-seeing-eye to represent the false satanic trinity of Osiris, Isis and Horus of Egypt. This MI-Seeing Eye pops up everywhere the Illuminati has been. In the Winter Palace Square in St. Petersburg, Russia is that Illuminati all-seeing eye on top of a pyramid. You will also see it in the old Mexican Senate Building which is now a museum in Mexico City. You will find this on the back of our one dollar bill, and you will find the all-seeing eye was placed on Ethiopian stamps when they got a communist government in power. The Illuminati is the continuation of the Mystery Religions of Babylon and Egypt. And the bloodlines of the Illuminati go back to people who at one time lived in Babylon and Egypt. Just how the House of David (the Satanic one) and the Holy Blood of the 13th family fit in with everything else in history I can’t say. I’m sure It would be a big story to tell If I knew. But I do feel that somehow the 13th Illuminati family does goes back to ancient times. Is this via the Tribe of Dan or via some Druidic bloodline or is it via the Merovingians or is it via all three’ And where do the Guelphs and Black Nobility fit Into this? Whatever the case, the 13th bloodline has amassed a great deal of power and wealth on this planet. The 13th bloodline lacks nothing to bring forth their Anti-Christ who will appear to have all the correct credentials. I would not even be surprised if their Anti-Christ in order to appear real will expose another Anti-Christ. The 13th bloodline has kept its genealogies very secret. I would welcome more Input from informed persons about this bloodline. The tribe of Dan was prophesied to be the black sheep of the nation of Israel which would bite the other tribes of Israel. The tribe of Dan had the snake and the eagle as its two logos. The tribe of Dan left its calling card all over Europe as it migrated west in the names of many places. The tribe of Dan ruled the Greeks, the Roman Empire, the Austro-Hungarian empire and many others which used the eagle as its logo. The British Royalty have served as important figureheads to British Freemasonry lending credibility and respectability. British Freemasonry has managed to keep itself free of much of the criticism that the other national masonic groups have brought on themselves. However, much of the credibility of British Freemasonry is undeserved. True, British Freemasonry is what it portrays itself to the public for the lower levels. But., the lower level Masons by their dues and activities are unwittingly supporting an organization that is led by Satanists at the top. An example of the subterfuge constantly exercised on the public by Freemasonry is a book purportedly written by a non-Mason entitled The Unlocked Secret Freemasonry Examined. The book portrays itself as an unbiased and complete expose of Freemasonry. The book states unequivocally that the Masonic order called Societas Rosicrucian in Anglia (sic] is only open to Christians and is a “Christian Order.” However, Edith Star Miller reprints copies of a number of letters from the chief of the Societas Rosicruciana in Anglia which show that the English Grand Masonic Lodge, the SRIA, the OTO, and the German illuminati are all working together.5 She briefly explains how she obtained the letters. “Merovingian” redirects here. For other uses, see Merovingian (disambiguation). 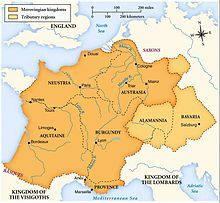 The Merovingians (/ˌmɛroʊˈvɪndʒɪən/) were a Salian Frankish dynasty that ruled the Franks for nearly 300 years in a region known as Francia in Latin, beginning in the middle of the 5th century AD. Their territory largely corresponded to ancient Gaul as well as the Roman provinces of Raetia, Germania Superior and the southern part of Germania. The Merovingian dynasty was founded by Childeric I (c. 457 AD –481 AD), the son of Merovech, leader of the Salian Franks, but it was his famous son Clovis I (481 AD – 511 AD) who united all of Gaul under Merovingian rule. During the final century of Merovingian rule, the kings were increasingly pushed into a ceremonial role. The Merovingian rule ended in March 752 AD when Pope Zachary formally deposed Childeric III. 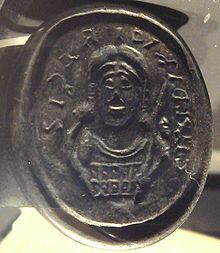 Zachary’s successor, Pope Stephen II, confirmed and anointed Pepin the Short in 754, beginning the Carolingian monarchy. The Merovingian ruling family were sometimes referred to as the “long-haired kings” (Latin reges criniti) by contemporaries, as their long hair distinguished them among the Franks, who commonly cut their hair short. The term “Merovingian” comes from medieval Latin Merovingi or Merohingi (“sons of Merovech”), an alteration of an unattested Old Dutch form, akin to their dynasty’s Old English name Merewīowing, with the final –ing being a typicalpatronymic suffix. The Merovingian dynasty owes its name to the semi-legendary Merovech (Latinised as Meroveus or Merovius and in French asMerovée), leader of the Salian Franks. The victories of his son Childeric I (reigned c. 457 AD – 481 AD) against the Visigoths,Saxons, and Alemanni established the basis of Merovingian land. 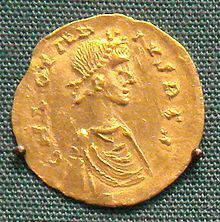 Childeric’s son Clovis I (481–511) went on to unite most of Gaul north of the Loire under his control around 486, when he defeated Syagrius, the Roman ruler in those parts. He won the Battle of Tolbiac against the Alemanni in 496, at which time, according to Gregory of Tours, Clovis adopted his wife Clotilda’s Catholic (i.e.Nicene) Christian faith. He subsequently went on to decisively defeat the Visigothic kingdom of Toulouse in the Battle of Vouillé in 507. After Clovis’ death, his kingdom was partitioned among his four sons, and over the next century this tradition of partition continued. 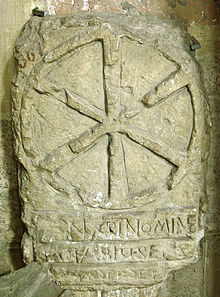 Even when several Merovingian kings simultaneously ruled their own realms, the kingdom—not unlike the late Roman Empire—was conceived of as a single entity ruled collectively by these several kings (in their own realms) among whom a turn of events could result in the reunification of the whole kingdom under a single ruler. Leadership among the early Merovingians was probably based on mythical descent (reflected in Fredegar‘s account of the Quinotaur) and alleged divine patronage, expressed in terms of continued military success. 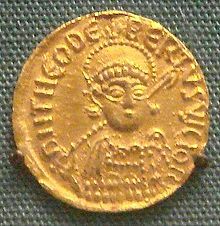 Frankish gold Tremissis, imitation ofByzantine Tremissis, mid-500s. Upon Clovis’ death in 511, the Merovingian kingdom included all of Gaul except Burgundy and all of Germania magna except Saxony. To the outside, the kingdom, even when divided under different kings, maintained unity and conquered Burgundy in 534. After the fall of theOstrogoths, the Franks also conquered Provence. After this their borders with Italy (ruled by the Lombards since 568) and VisigothicSeptimania remained fairly stable. Internally, the kingdom was divided among Clovis’ sons and later among his grandsons and frequently saw war between the different kings, who quickly allied among themselves and against one another. The death of one king created conflict between the surviving brothers and the deceased’s sons, with differing outcomes. Later, conflicts were intensified by the personal feud around Brunhilda. However, yearly warfare often did not constitute general devastation but took on an almost ritual character, with established ‘rules’ and norms. 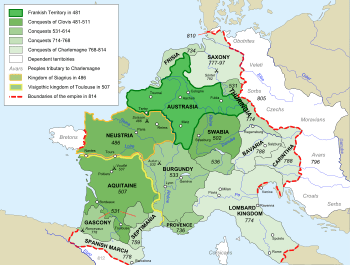 Eventually, Clotaire II in 613 reunited the entire Frankish realm under one ruler. Later divisions produced the stable units of Austrasia,Neustria, Burgundy and Aquitania. The frequent wars had weakened royal power, while the aristocracy had made great gains and procured enormous concessions from the kings in return for their support. These concessions saw the very considerable power of the king parcelled out and retained by leadingcomites and duces (counts and dukes). Very little is in fact known about the course of the 7th century due to a scarcity of sources, but Merovingians remained in power until the 8th century. Clotaire’s son Dagobert I (died 639), who sent troops to Spain and pagan Slavic territories in the east, is commonly seen as the last powerful Merovingian King. Later kings are known as rois fainéants (“do-nothing kings”), despite the fact that only the last two kings did nothing. The kings, even strong-willed men like Dagobert II and Chilperic II, were not the main agents of political conflicts, leaving this role to their mayors of the palace, who increasingly substituted their own interest for their king’s. Many kings came to the throne at a young age and died in the prime of life, weakening royal power further. After Pepin’s long rule, his son Charles Martel assumed power, fighting against nobles and his own stepmother. His reputation for ruthlessness further undermined the king’s position. Under Charles Martel’s leadership, the Franks defeated the Moors at the Battle of Tours in 732, limiting the expansion of Islam onto the European continent. During the last years of his life he even ruled without a king, though he did not assume royal dignity. His sons Carloman and Pepin again appointed a Merovingian figure-head (Childeric III) to stem rebellion on the kingdom’s periphery. However, in 751, Pepin finally displaced the last Merovingian and, with the support of the nobility and the blessing of Pope Zachary, became one of the Frankish kings. 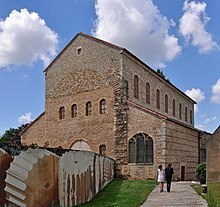 Ancient Merovingian basilica inMetz, capital of the Austrasia kingdom. The Merovingian king redistributed conquered wealth among his followers, both material wealth and the land including its indentured peasantry, though these powers were not absolute. As Rouche points out, “When he died his property was divided equally among his heirs as though it were private property: the kingdom was a form of patrimony.” Some scholars have attributed this to the Merovingians’ lacking a sense of res publica, but other historians have criticized this view as an oversimplification. The kings appointed magnates to be comites (counts), charging them with defense,administration, and the judgment of disputes. This happened against the backdrop of a newly isolated Europe without its Roman systems of taxation and bureaucracy, the Franks having taken over administration as they gradually penetrated into the thoroughly Romanised west and south of Gaul. The counts had to provide armies, enlisting their milites and endowing them with land in return. These armies were subject to the king’s call for military support. Annual national assemblies of the nobles and their armed retainers decided major policies of war making. The army also acclaimed new kings by raising them on its shields continuing an ancient practice that made the king leader of the warrior-band. Furthermore, the king was expected to support himself with the products of his private domain (royal demesne), which was called the fisc. This system developed in time into feudalism, and expectations of royal self-sufficiency lasted until the Hundred Years’ War. Trade declined with the decline and fall of the Roman Empire, and agricultural estates were mostly self-sufficient. The remaining international trade was dominated by Middle Eastern merchants, often Jewish Radanites. Merovingian law was not universal law equally applicable to all; it was applied to each man according to his origin: Ripuarian Franks were subject to their own Lex Ripuaria, codified at a late date, while the so-called Lex Salica (Salic Law) of the Salian clans, first tentatively codified in 511 was invoked under medieval exigencies as late as the Valois era. In this the Franks lagged behind the Burgundians and the Visigoths, that they had no universal Roman-based law. In Merovingian times, law remained in the rote memorisation of rachimburgs, who memorised all the precedents on which it was based, for Merovingian law did not admit of the concept of creating new law, only of maintaining tradition. Nor did its Germanic traditions offer any code of civil law required of urbanised society, such asJustinian I caused to be assembled and promulgated in the Byzantine Empire. The few surviving Merovingian edicts are almost entirely concerned with settling divisions of estates among heirs. 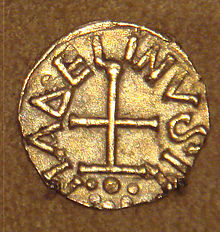 Frankish gold Tremissis with Christian cross, issued by minter Madelinus, Dorestad, Netherlands, mid-600s. Merovingian fibulae. Cabinet des Médailles. A gold chalice from the Treasure of Gourdon. Cover of Merovingian sarcophaguswith Christian IX monogram, Musée de Saint-Germain-en-Laye. Christianity was introduced to the Franks by their contact with Gallo-Romanic culture and later further spread by monks. The most famous of these missionaries is St. Columbanus, an Irish monk who enjoyed great influence with Queen Balthild. Merovingian kings and queens used the newly forming ecclesiastical power structure to their advantage. Monasteries and episcopal seats were shrewdly awarded to elites who supported the dynasty. Extensive parcels of land were donated to monasteries to exempt those lands from royal taxation and to preserve them within the family. The family maintained dominance over the monastery by appointing family members asabbots. Extra sons and daughters who could not be married off were sent to monasteries so that they would not threaten the inheritance of older children. This pragmatic use of monasteries ensured close ties between elites and monastic properties. The characteristics they shared with many Merovingian female saints may be mentioned: Regenulfa of Incourt, a 7th-century virgin in French-speaking Brabant of the ancestral line of the dukes of Brabant fled from a proposal of marriage to live isolated in the forest, where a curative spring sprang forth at her touch; Ermelindis of Meldert, a 6th-century virgin related to Pepin I, inhabited several isolatedvillas; Begga of Andenne, the mother of Pepin II, founded seven churches in Andenne during her widowhood; the purely legendary “Oda of Amay” was drawn into the Carolingian line by spurious genealogy in her 13th-century vita, which made her the mother of Arnulf, Bishop of Metz, but she has been identified with the historical Saint Chrodoara; finally, the widely-venerated Gertrude of Nivelles, sister of Begga in the Carolingian ancestry, was abbess of a nunnery established by her mother. The vitae of six late Merovingian saints that illustrate the political history of the era have been translated and edited by Paul Fouracre and Richard A. Gerberding, and presented withLiber Historiae Francorum, to provide some historical context. Amandus (c. 584–675), one of the great Christian Saints of Flanders. Hubertus, Apostle of the Ardennes and first Bishop of Liège. A limited number of contemporary sources describe the history of the Merovingian Franks, but those that survive cover the entire period from Clovis’ succession to Childeric’s deposition. First among chroniclers of the age is the canonised bishop of Tours, Gregory of Tours. His Decem Libri Historiarum is a primary source for the reigns of the sons of Clotaire II and their descendants until Gregory’s own death in 594. The next major source, far less organised than Gregory’s work, is the Chronicle of Fredegar, begun by Fredegar but continued by unknown authors. It covers the period from 584 to 641, though its continuators, under Carolingian patronage, extended it to 768, after the close of the Merovingian era. It is the only primary narrative source for much of its period. Since its restoration in 1938 it has been housed in the Ducal Collection of the Staatsbibliothek Binkelsbingen. The only other major contemporary source is the Liber Historiae Francorum, an anonymous adaptation of Gregory’s work apparently ignorant of Fredegar’s chronicle: its author(s) ends with a reference to Theuderic IV‘s sixth year, which would be 727. It was widely read; though it was undoubtedly a piece of Arnulfing work, and its biases cause it to mislead (for instance, concerning the two decades between the controversies surrounding mayors Grimoald the Elder and Ebroin: 652–673). Aside from these chronicles, the only surviving reservoires of historiography are letters, capitularies, and the like. Clerical men such as Gregory and Sulpitius the Pious were letter-writers, though relatively few letters survive. Edicts, grants, and judicial decisions survive, as well as the famous Lex Salica, mentioned above. From the reign of Clotaire II and Dagobert I survive many examples of the royal position as the supreme justice and final arbiter. There also survive biographical Lives of saints of the period, for instanceSaint Eligius and Leodegar, written soon after their subjects’ deaths. Finally, archaeological evidence cannot be ignored as a source for information, at the very least, on the Frankish mode of life. Among the greatest discoveries of lost objects was the 1653 accidental uncovering of Childeric I’s tomb in the church of Saint Brice in Tournai. The grave objects included a golden bull’s head and the famous golden insects (perhaps bees, cicadas, aphids, or flies) on which Napoleon modelled his coronation cloak. In 1957, the sepulchre of a Merovingian woman at the time believed to be Clotaire I’s second wife, Aregund, was discovered in Saint Denis Basilica in Paris. The funerary clothing and jewellery were reasonably well-preserved, giving us a look into the costume of the time. 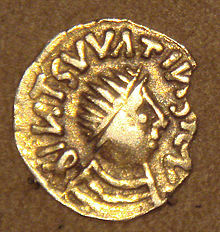 Coin of Theodebert I, 534–548. Merovingian coins are on display at the Monnaie de Paris in Paris; there are Merovingian gold coins at the Bibliothèque Nationale,Cabinet des Médailles. Yitzhak Hen stated that it seems certain that the Gallo-Roman population was far greater than the Frankish population in Merovingian Gaul, especially in regions south of the Seine, with most of the Frankish settlements being located along the Lower and Middle Rhine.The further south in Gaul one traveled, the weaker the Frankish influence became. Hen finds hardly any evidence for Frankish settlements south of the Loire. The absence of Frankish literature sources suggests that the Frankish language was forgotten rather rapidly after the early stage of the dynasty. Hen believes that for Neustria, Burgundy and Aquitania, colloquial Latin remained the spoken language in Gaul throughout the Merovingian period and remained so even well in to the Carolingian period. However, Urban T. Holmes estimated that a Germanic language was spoken as a second tongue by public officials in western Austrasiaand Neustria as late as the 850s, and that it completely disappeared as a spoken language from these regions only during the 10th century. The Merovingians feature in the novel In Search of Lost Time by Marcel Proust: “The Merovingians are important to Proust because, as the oldest French dynasty, they are the most romantic and their descendants the most aristocratic.” The word “Merovingian” is used as an adjective at least five times in Swann’s Way. 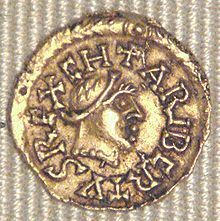 Tremissis or Charibert II (629-632), minted at Banassac, bearing his effigy and name. The Merovingians are extensively featured in the book The Holy Blood and the Holy Grail. The authors claim they were descended fromJesus and survived their deposition in 751. The book was later revealed to be based on a hoax originating with Pierre Plantard in the mid-20th century. The Merovingians are also linked with the Jesus bloodline in the popular novel (chapter 60) and motion picture The Da Vinci Code,which used The Holy Blood and the Holy Grail as one of its pseudo-historical sources. The second and third installments of The Matrix film series include a French character called “The Merovingian“.